Based on long-established algorithms, this numerology chart calculator includes Master numbers, Karmic Debt numbers, and other double-digit numbers whenever applicable. 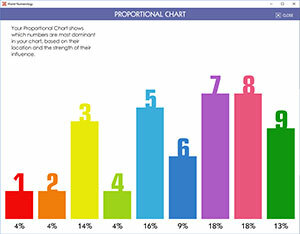 Master numbers are felt strongly when found in certain locations in the numerology chart, such as the Life Path, Birth Day, the core name numbers, Maturity number, Essence cycles, and the long-term cycles. In most other locations their influence is minimal. Karmic Debt numbers are most important found in similar locations, but are particularly powerful when found among the cycles. 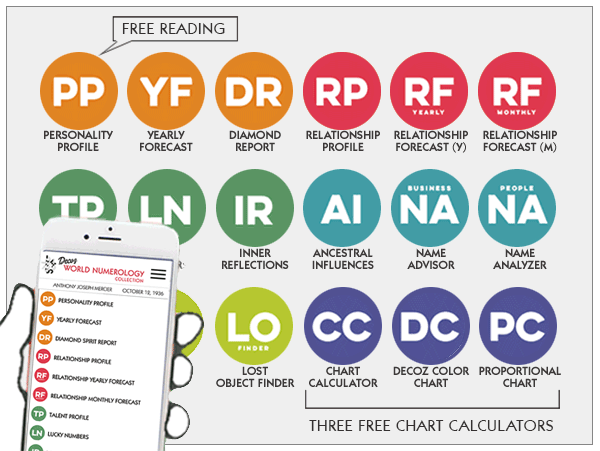 Our World Numerology app, a software application designed for individual use (scroll down the page for a free download), as well as our professional numerology software, includes one or more chart calculators. The World Numerology App for iPhone, iPad, PC, Mac, and Android. 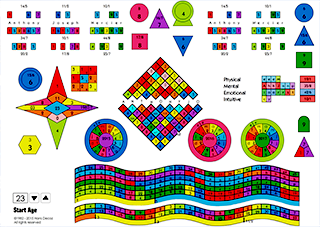 Also included are the Decoz Chart system and the new Proportional Numerology chart; a particularly cool and insightful method. Samples of each are shown below. Basically the same information as is shown above, but laid out in an easy to oversee manner and including 50 years of cycles.